Donald Trump vowed during the campaign to get rid of a tax loophole used by some millionaire and billionaire investors to slash their bills. "The hedge fund guys won't like me as much as they like me right now. I know them all, but they'll pay more," he said during a Republican debate sponsored by CNN in 2015. "I know people that are making a tremendous amount of money and paying virtually no tax, and I think it's unfair." But the tax break, known as the "carried interest" provision, remains essentially intact in both the House and Senate tax bills now under consideration. Despite the popular impression that the carried interest provision is a break for hedge fund managers, it's really private equity managers and real estate managers who benefit from it. It lets them pay a lower rate of just 20% on investment profits that are paid to fund managers, instead of the standard rate of nearly 40% for anyone in the top tax bracket. Trump himself said that those benefiting from the break were "getting away with murder." "They pick a stock and all of sudden they make a lot of money. 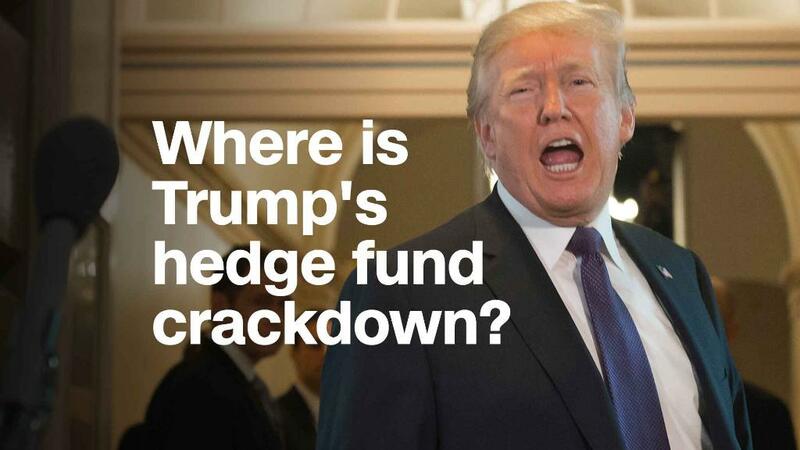 I want the hedge fund guys to pay more taxes," he said. But so far there is only one change in the carried interest provision in either bill. The proposed tax reforms stipulate that in order to qualify for the lower rate, the investments must be held for three years instead of the current requirement of one. But anyone who benefits from the carried interest provision typically holds their investments for much longer than three years, said Steven Rosenthal, a senior fellow at the nonpartisan Tax Policy Center. "That's a travesty," he said. "It is a cosmetic change to make it seem like something is being done with carried interest when nothing is being done." The nonpartisan Joint Committee on Taxation, which tracks the impact of legislation, estimates that the change would increase revenue by only $1.2 billion over the 10-year period from 2018 to 2027, or $120 million a year. The JCT estimate confirms that change in the law "on carried interest is a bad joke," tweeted University of San Diego law professor Victor Fleischer. He made the tongue in cheek suggestion of having just a few of the top private equity mangers pay the top rate of 39.6%. By comparison, a recent Democratic proposal to close the carried interest loophole was estimated to increase tax collections by $17 billion over 10 years, netting $1.6 billion in its first year alone.